Sushi Steal of Tribeca – These Two Eyes! When friends of mine proposed all you can eat & drink Sushi in Tribeca for a mere $30 I was skeptical, this has to be the california roll only kind of deal. So as a group of us hauled into a few cabs and made the short trek from the West Village over to Greenwich Street my mind was racing of the thought of spending my hard-earned pennies potentially planting me in bed all weekend from consuming defective raw fish. If you’re attempting to visit Ashiya III (also has sister locations in the East Village and Jersey City) on a weekend make reservations. Simple enough – this place gets packed! Walking in we were quickly ushered to a group of small wooden tables pushed together making one long sake-bomb shelf. Listening to the amusing and rambunctious tables around us it was evident that we could wait no longer. At precise timing the waitress delivered to each table setting a clear glass cup, and inside, a ceramic sake cup. Bang, drop, drink. With careful expertise the gentlemen of the table poured their glass cups halfway with Asahi Beer. Next the sake cups were filled from the small white sake pitchers. Chop sticks were placed side by side and layed on top of the beer cups. 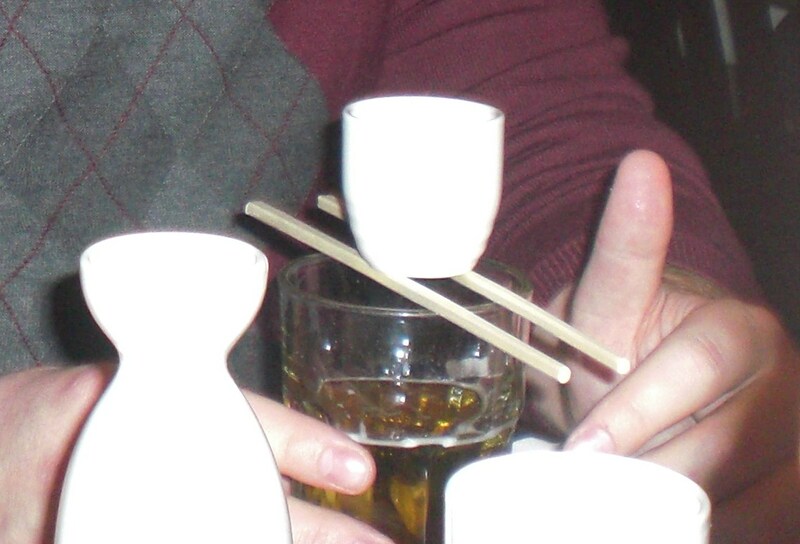 Then the sake cup was placed on top of the chop sticks. All are ready and marching orders are in place. At the count of three…bang, drop, drink! Fists pound on the table; sake quickly drops in the beer cup; and the men rush to drink the contents as fast as possible. I see a long night ahead of us. What’s most impressive about this place is the two-sided menu. At first glance, the one side has your traditional sashimi and basic sushi roll offerings – spicy crunchy tuna, california roll, philadelphia roll. This met my expectations and therefore I was ready to order my usual “I’m on a budget” fare but before I could complete my order the waitress quickly pointed out that there’s more. There’s more? (subtle eye brow lift). Heck yes there’s more! There’s maki rolls made from real crab meat and speciality rolls – each unique enough to make you scratch your head and ask yourself, but which one do I choose? Choose all! It’s all you can eat, duh! A few table favorites included the Lover Roll (salmon, crab stick, and avocado with spicy crunchy tuna on top) or the Dinosaur Roll (cucumber, avocado, and tempura flake with broiled white tuna and masago on top). When your 2 hours are up it’s time to get out and the staff aren’t afraid to say so. We started to notice before our next pitcher of beer was ordered and the few pieces of sushi were soon scarfed down a check magically appeared on our table. The extra $10 per person thrown on for tax and gratuity make the $30 all-inclusive more like a $40 all-inclusive but hey, it still ain’t a bad deal baby and the sushi was damn good. Fran’s has a Point-of-Sale system that is hard wired into their network. The Wireless N Router supports all current methods of wireless security, including WPA, WPA2, and WPS. They can get your personal information just by connecting to your Wi-Fi. pruning all through the growing season to stay manageable. and because of this, people are left with very little time to properly maintain their homes or property.